Many things at the Hackspace are organised by a board of seven volunteers, follow that link and approach the relevant one if you have any related issues. Local takeaway and corner shop. 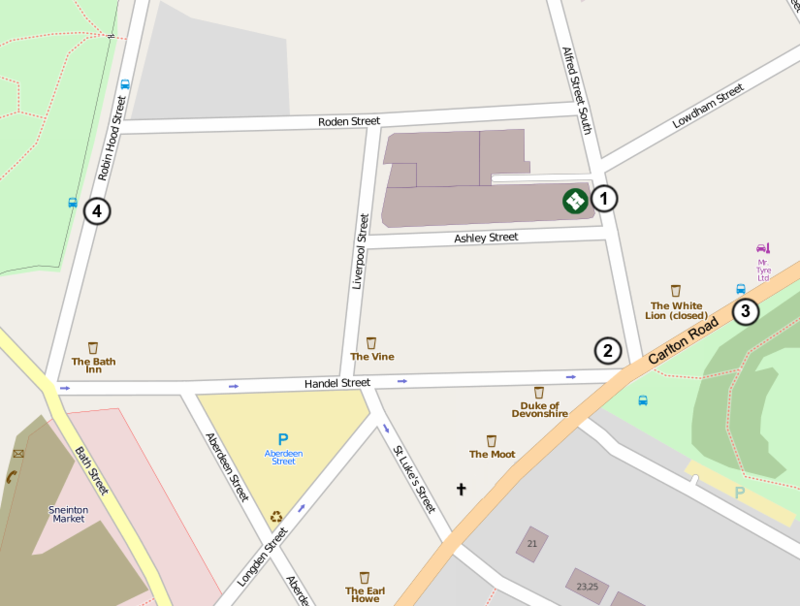 Bus stops on Carlton Road: City buses 24, 25, 26, 27, 100. Shoplink S10. From the Hackspace, the National Ice Centre is located South West down Carlton Road, the City Centre West-North-West past Sneinton Market. As a member, you can get 24/7 access to the hackspace. There are a bunch of doors between us and the street though. Some barriers have physical keys, others have slightly more hi-tech locking solutions. The access page has the most up to date details of how to get in whenever you want. Keys are available for a deposit. The space has member-use WiFi at all times. There's also free wifi for non-members between 18:00 and 21:00 on open hack nights. Any member paying more than £10 per month in membership is entitled to keep a 35 litre box at the space. Boxes are supplied at cost (£5) by the hackspace, this ensures they're consistent and can stack. Any box bought becomes your property. If you're paying over £20, then you're welcome to keep two boxes if you need them. The best way to get one is to pay in cash at an open hack night, or when you're in the space with a board member. If you have a box, we ask that you put you real name on it (The board member who sorts your box will get the label maker out for you). Some members also put their Twitter names on their boxes too. Sometimes, a project is too big to go in a member's box. If so, talk to someone on the board about it. We have room for stuff, but it is of course finite. In the Hackspace, you'll see stores of things like wood, metal, and electronics components. There are also boxes full of general hardware, enclosures, etc. Additionally, there are two large grey plastic boxes in the members store room, full of things you can help yourself to for projects, or put things in that you don’t want but think might be useful to others. All of these resources are free for members to use, we just ask a couple of things: Donate any offcuts you're not using (no matter how small) rather than throwing them away, and don't take too much. "Too much" is down to members' judgment. There is also a #nottinghack IRC channel, located on chat.eu.freenode.net. There will usually be at least a couple of board members in there on any given day. If you have any questions or requests, the best places to ask are the public group (unless your question involves confidential stuff), the IRC channel, or in person at the Open Hack night, which is every Wednesday from 18:30. Occasionally, everyone disappears to the pub sometime between 22:00 and 23:00, usually the Moot Hall, and if that’s closed, Bunker’s Hill Inn beside the National Ice Centre.